2016 was a big year for giraffe and GCF. We have continued to make a mark in giraffe conservation in Africa and have managed to get some international attention to our long-necked friends. Featuring our work in a BBC/PBS documentary and telling the story of the plight of giraffe in such a visual way has helped to bring giraffe to the international conservation agenda. The new findings that there might not be one but four giraffe species in Africa has fascinated not only the scientific community, but gave giraffe a lot of well-deserved media coverage. This was only topped with the bitter-sweet news that giraffe are now ‘Vulnerable’ on the IUCN Red List of Threatened Species. While this is sad news indeed, it has not come as a surprise to us at GCF and having the peril of giraffe confirmed by the IUCN (with our support) will hopefully help our efforts to conserve these amazing creatures in Africa. We would also like to use this opportunity to thank all our donors and supporters! Without you, all this work would not be possible. Thank you for sticking your necks out for giraffe conservation in Africa. Together we can make a difference! Operation Twiga was a joint effort of the Uganda Wildlife Authority and GCF and involved many partners and supporters to make this a huge success. Funding from World Giraffe Day – 21 June – made this conservation translocation of 20 Nubian (formerly Rothschild’s) giraffe possible. We are very happy to report that the giraffe on the southern side of the Nile River are doing well and we are planning to supplement the population later this year. At the same time, the Reticulated Giraffe Conservation Programme in northern Kenya is progressing with a good team of local staff and equipment in place, and we will get back with more exciting updates soon – GPS satellite collaring, hint hint! In Namibia, almost 2,000 school children participated in the Khomas Environmental Education Programme (KEEP) during its first year of operation. Both programmes are supported with World Giraffe Day funds and have really helped move giraffe conservation forward. With so many changes in giraffe status and taxonomy, it was about time to update our website and materials. We can now proudly report that we have updated all materials – but please let us know if we have missed anything. All posters and the new conservation guide booklet can be downloaded for free from our website. Please get in touch for high resolution versions for printing. GCF has developed a Strategic Framework as a ‘road map’ to guide conservation activities throughout Africa and, where appropriate, to inform future country, species or subspecies plans and/or an Africa wide Giraffe Conservation Strategy. The document can be downloaded here. While giraffe conservation and conservation in general is often associated with a lot of doom and gloom, there are also some success stories. In the mid 1990s only 49 West African giraffe remained in the whole of West Africa. GCF is working closely with the Niger Government and local NGO AVEN to make giraffe conservation in Niger a success. We are excited to report that based on the latest survey numbers the West African giraffe have increased to approx. 550 individuals! You can download the latest survey report here. Proudly wear your support for GCF! The GCF Gift Shop has official t-shirts, tote bags, and more items. 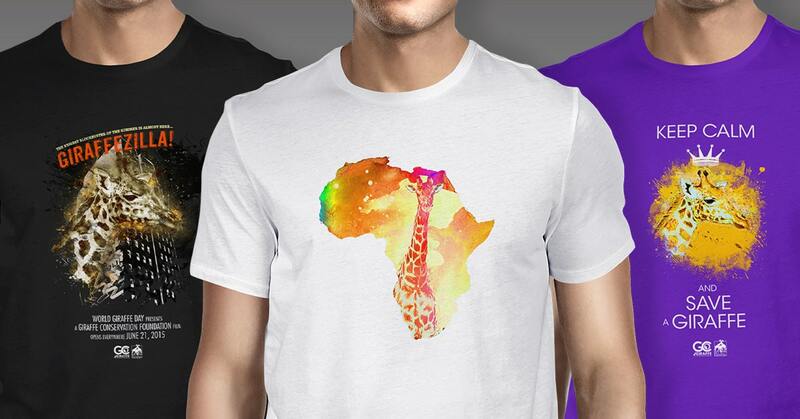 Proceeds from every sale help fund our conservation work in Africa. Hello, I have become a true-blue giraffe lover, having been one of the hundred of thousands fan’s of ANIMAL ADVENTURE PARK in Harpursville, NY snd teir very prgnant April the Giraffe who is about to delivery her fourth calf any day now. I also viewed your BBC documentary. It broke my heart and uplifted it at the same time. How very sad and barbaric that these (and other) amazing animals are endangered because of “man’s” greed”, it is so disheartening! I have donated to AAP and when I can will donate to GCF to do (and other species) my small part in supporting your giraffe (and other species). Best of Luck and Stay Safe! Greetings from Odessa, Texas. I am another “April watcher” who has discovered your wonderful work in saving giraffe. I will be doing my part, what I can, to also continue increased awareness and participate in World Giraffe Day. I was happy to see the Abilene Zoo listed on the WGD page. It is the closest to me, 200 miles. I have always wanted to visit the zoo but unfortunately, it is closed when I have been there. I will definitely be going there soon!! I have donated to AAP where a portion does go to GCF and plan to also donate directly to you when I have an income again. (accident, no work for a year) I hope the amount April and AAP has generated for your foundation is a significant amount based on your annual needs. I understand every penny makes a difference but I really do hope this increased awareness and donations are able to really make a difference in your work! I almost feel guilty for not being aware of their plight before now. Thank you for being their champion. The giraffe are silent no longer!